Nothing replaces the look of wood. 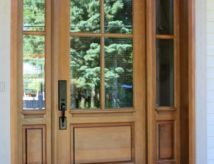 We offer an extensive line of wood doors that are 2 1/4 inches thick which exceeds the industry’s standard. We offer a vast choice of models which can be harmonized with both contemporary and traditional styles. Each wood door model has an automatic multipoint locking system that offers the ultimate in security. Our door’s uniquely designed sill provides a double drainage system which ensures superior air and water tightness as well as longevity.